Dalston Kingsland towerblock. Hackney goes for the money. Dalston to get Shaft(ed). At the 'standing room only' public meeting last night at Colvestone Primary School hall local people were outraged to hear that Hackney Council's Head of Planning has signed off the report to its Planning Committee recommending that it should grant planning permission for a 50 metre tall, private 18-storey towerblock on historic Kingsland High Street in Dalston with NO affordable housing. The Council's Planning Committee will meet to consider the report on 7th March. You can read about the main features of the scheme here. Over 95% of local people present at the meeting were not aware that the developer's PR company, Four Communications (read more about them below), had already conducted "comprehensive community consultation " about the scheme. One event was in Ridley Road market when 112 people attended. Of the 15 feedback forms returned 50% of respondents stated that they were NOT "broadly supportive of these proposals". A second meeting was held at Centerprise, which included special invitations to contacts previously made, but "very few people attended". This outcome, the developer reported to Hackney, shows "very positive levels of support for the scheme. There is a strong desire from the local residents to see the development brought forward." The developer and Hackney's commitment to public consultation included commencing the formal planning consultation period 2 days before the Christmas holiday. Although the Council acknowledges that the greatest need locally is for affordable housing, and its policy is for 50%, the report recommends that there should be NO affordable housing in the development. The developer has offered to pay £1.7 million to upgrade the Dalston Kingsland station which, the Council says, "presents a unique opportunity to deliver significant public benefits that would support future residential and economic growth in Dalston". The upgrade involves re-modelling the station canopy and installing 2 lifts. The developer says that building less than 130 flats over 18 storeys would simply be "financially unviable". The scheme will have £1 million penthouses and the developer had declared an estimated profit of £10.8 million. English Heritage has objected to the plans as has the Victorian Society which states that the scheme amounts to "overdevelopment which would damage an important historic environment...A tragic missed opportunity for Dalston". Local planning policy requires tall buildings to "not impinge on the setting of, or views to, listed buildings and conservation areas". 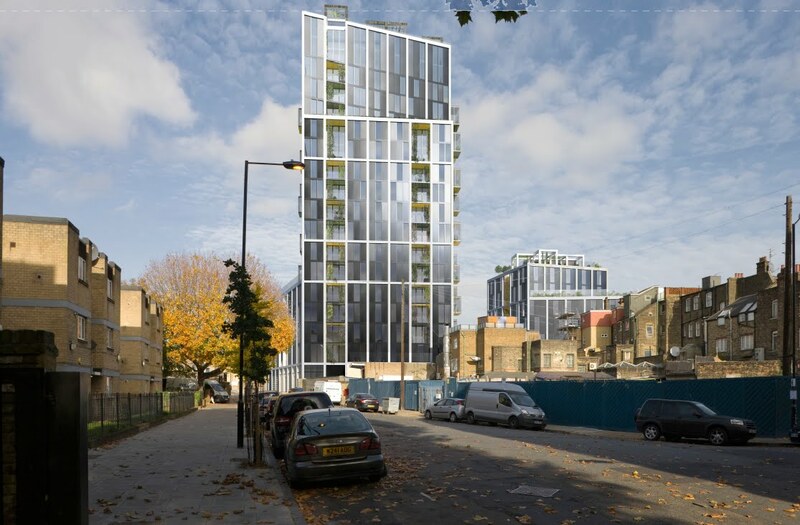 But Hackney's report says the development "does comply" and that the "scale of the building and its striking appearance would provide an interesting contrast". It would "mark the train station" and "make Dalston town centre more legible". Boris' Greater London Authority (GLA) has an overarching power to stop such schemes. But the GLA has already commented (following a meeting with the developer and TfL last August) that "The principle of a high density mixed use scheme on this site is in line with London Plan policy" OPEN has raised objections to all these issues with the GLA which has since commissioned an independent financial report on the Dalston scheme. Tomorrow Boris, Mayor of the GLA London Assembly, will consider the report and make a decision. He stopped an inappropriate scheme in Queens Market and recently intervened to prevent wholesale demolition and gross redevelopment in Forest Gate. Will Boris step in to Dalston as he did there - or is there too much money involved to stop the corporate feeding frenzy? You can see details of the application 2011/3439 on the Council's web site here. The "Dressed in Green" tower is being promoted by the developer's PR company, Four Communications, which has recruited Hackney's Deputy Mayor Karen Alcock and Councillor Alan Laing (formerly a member of Barratt's PR firm Hard Hat). "We are keen to use Alan’s extensive network of contacts within London politics" said Councillor Laing's new Managing Director whose company is also promoting the new Sainsburys planned for Stoke Newington and the controversial Stamford Hill school development. PPS Rumour has it that Cllr Mayor Karen Alcock has also resigned as Hackney's Deputy Mayor. Who will replace her? Someone who will stand up for Dalston we hope. "completely inaccurate" so we've asked them to come to the meeting too and explain why. Is it a beacon which will enhance Dalston's environment? The 50 metre high tower will dominate and cast shadows across the Kingsland area. Like a lighthouse in reverse, it will steal the sunlight from public space, homes, businesses, locally listed buildings, Ridley Road market and Colvestone School. The tower will cause higher wind speeds locally so that some public areas around the building will become "unsuitable for standing" (sometimes, the consultants say, "the criteria for safety of all pedestrians including sensitive pedestrians and cyclists is exceeded"). Will it meet housing need locally? There will be 130 flats for sale but NO affordable homes to buy or rent. The original plan for 17 flats (13%) for sale at "affordable" prices has been dropped (too expensive for the developer - see why below). Policy guidelines are for 50% affordable housing, including some at affordable rents. Nor will there be sufficient family size homes ( 3-beds or more) to meet official policy guidelines. Now there will be 100% "unaffordable" flats in the exclusive "Dressed in Green" tower with its a own secure entrance. The penthouse duplex apartments there will each cost around £1,000,000 (£1 million). The designs ("exemplary" according to the developer) were so poor that 30% of flats didn't meet the official (GLA) minimum sizes. The Council is now examining the developer's claims that the new layouts mean that 97% of the flats are at least of the minimum size. Does it matter if they're rabbit hutches? Yes because, on current market trends, about 50% < 60% of the flats will be sold to overseas investors not for them to live in but to rent them out ( at "unaffordable" rents) to people who have very little choice given the shortage of accommodation. Where is the public benefit to justify this over-development of the site? The developer expects to net a profit of at least £10,000,000 (£10 million). What will Dalston get back for all it will lose? The developer has dropped the affordable housing and instead proposes to increase its spend to £1.7 million on a "once in a generation" opportunity to remodel and install lifts in the station. 95% of people surveyed using the overcrowded station agree it needs upgrading and we agree with them 100%. Network Rail and Transport for London (TfL) (Public) have already agreed with the developer (Private) that they won't build above the station. So the developer has acquired the benefit of being able to build up to the railway's boundary and have windows in the towers north face. That agreement increases the value of the developer's site considerably. TfL were at the meetings with the developer and the GLA when the designs were discussed. If the public landowner has benefited its neighbouring private landowner in this way then what has the public got back? We have asked the GLA why TfL aren't paying for the station upgrade. We have also ask TfL . We are still waiting for replies. Is TfL planning to dump on Dalston again? Despite the developers hype about the Dalston Green "eco-tower" the build quality does not reach the Code 5 (the highest) standard for sustainable homes (Too expensive for the developer). The rooftop, and the high maintenance 'hanging' gardens, if installed, will be paid for by service charges (on top of the "unaffordable" rents). And everyone will be offered a planter to grow their own veg on the balcony. No vegetation is sustainable on the bleak North Face of the tower. We don't object to the greenery. We do object to the 'dressed in green' PR. The developer says the designs are inspired by the Eastern Curve and the Bootstrap roofgardens (They are an inspiration. Ed). But those are community gardens and the "dressed in green" tower is exclusively private. Does it respect its neighbours? This 1902 Grade II Listed building, Cooke's old Eels Pie and Mash shop, is next to the development site. It is one of an exquisite group of buildings with diverse architecture and fine detailing including the Kingsland Pub (which English Heritage says should be locally listed). The tower will overlook four conservation areas. The listed buildings directly affected also include the Rio Cinema, Colvestone Primary School and locally listed buildings opposite at 74-76 Kingsland High Street. We agree with English Heritage - the scheme conflicts with Hackney's policy that "all development should make a positive contribution to the character of Hackney's historic and built environment", that the 6-8 storey overscale frontage "damages" the setting of our listed building and that the schemes bulk "will detract from the small scale of the (St Mark's) conservation area". But the developer has refused to reduce the scale of the building at all. Does the Dalston Kingsland station need a 'landmark', a 'gateway', building? 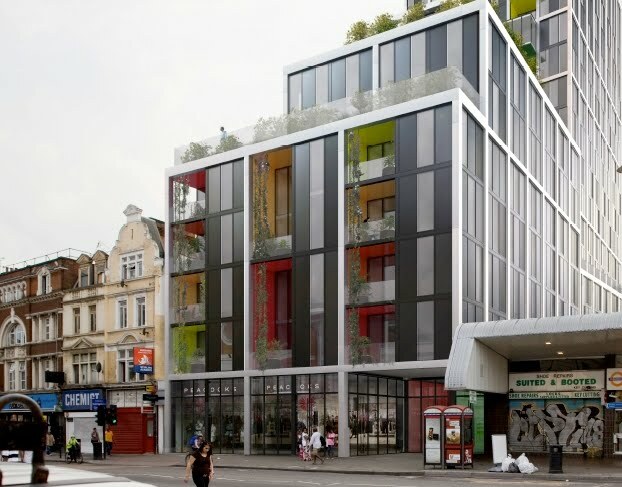 The developer and the Council say we need a tall building to "landmark" the Dalston Kingsland station - but in fact anything taller than 4-storeys would be prominent on our high street. So, in the future, when we arrive at the station, we will see the bleak North Face of Dalston Green tower rising above us like a sheer 50 metre aluminium and glass cliff blotting out the sunlight. For sure we will know that we have arrived somewhere. But where? Dalston?... or is it Canary Wharf, Croydon, Hong Kong? Is this the image of Dalston we want to present to visitors? And to ourselves? Will it be an icon - or an eyesore? Everyone will have their own opinion on this. We've said to the Council, and the GLA, that we think greater and better use could be made of the existing Peacocks site and that an imaginatively designed modern building there which respects its neighbours could enhance Dalston's character and identity. We also think buildings have context and that a well designed building is "in context" and so enhances the area and its "sense of place" and doesn't look "out of place". We think the developer's design is 'overscale' and amounts to 'overdevelopment', it will dominate and so diminish neighbouring buildings, but the developer has refused to reduce it. It extracts huge development value from the site - but at the expense of the surrounding area. Where is that value coming from? It's being taken from Dalston. Permanently. 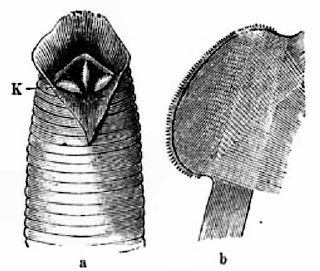 Our guest writer, field biologist Clear Hardly, alerts us to evolutionary changes occuring in East London's invertebrates, particularly leeches, which are on the move since the authorities disturbed their ancient habitats in the waterways of Hackney Marshes to develop the 2012 Olympic Park in Stratford. 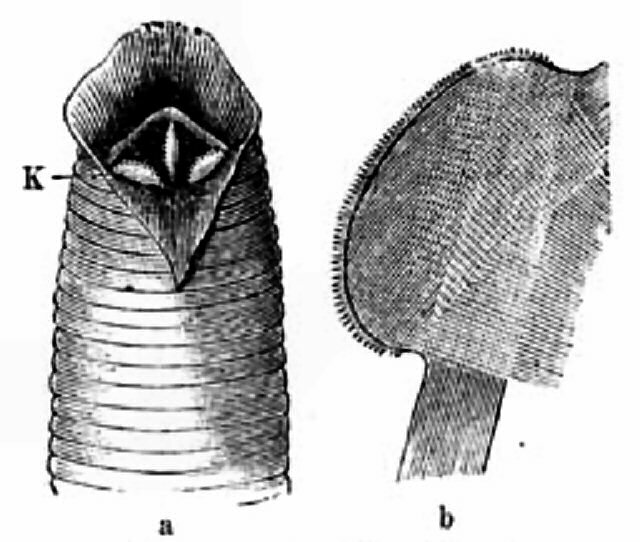 Hirudo leech: Segmented worm of the Phylum Annelida species, with anterior and posterior suckers, hermaphrodites, it explores it's water environment and feeds on its host injecting anti-coagulents to assist predation and, when gorged with blood, it falls away. Hirudo gigantae vulgaris: these huge, marsh emergent, leeches are now wholly terrestrial in form. They feed on development sites, inject capital and rapaciously extract huge value from their hosts at the expense of future generations. They favour brownfield and, increasingly, greenfield land. When gorged they fall away and move on in search of new opportunity sites. "Not to be mistaken for pond life, I urge local communities to keep a wary lookout for Hirudo gigantae vulgaris" said Clear Hardly "particularly around London's East End brownfield sites like Dalston, Stoke Newlington, London Fields, Forest Gate and Shoreditch. Even community gardens, sportsfields and parkland are no longer safe. When they feed....you bleed! " English Heritage have written to Hackney Council pointing out that the Dalston Kingsland towerblock proposal conflicts not only with national planning policies but also with the Council's own policies in the Dalston Area Action Plan. An artists impression of the 50 metre high, 18-storey tower planned for the Peacocks site next to Dalston Kingsland station. The report highlights the Council's own Core Policy 25 which states that "All development should make a positive contribution to the character of Hackney's historic and built environment . This includes identifying, conserving and enhancing the historic significance of the borough's designated heritage assets, their setting and where appropriate the wider historic environment"
The English Heritage report notes that the site is surrounded by the Kingsland, Stoke Newington and St Marks Conservation Areas and it particularly highlights the architectural heritage of the Grade 2 listed building next to the site and also recommends that another building in the group, the Kingsland Pub, should be listed by the Council. English Heritage advises that, contrary to the Council's policies, " the setting of the listed building... is harmed by the proposal" and that "the bulk and materials of of the proposed building will detract from the small scale of the (St Mark's) conservation area"
English Heritage reminds Hackney of government policy that "the greater the negative impact, the greater the benefits that will be needed to justify the approval". Regarding the tower, which is set back from the high street, "it will greatly change the character of Boleyn Road and we encourage the local planning authority to test this impact"
The proposed tower will have no affordable housing. It will dominate and cast shadow over local homes, businesses, Colvestone Primary School, locally listed buildings and public amenity space. It will be an exclusive private block with duplex penthouse apartments costing about £1million each. Most flats will be sold to overseas investors.The developer of this £50 million scheme is offering just £1.7 million to upgrade the Dalston Kingsland station. What price Dalston? You can see details of Dalston Kingland planning application 2011/3439 on the Council's web site here. The Council's official consultation deadline has now been extended. 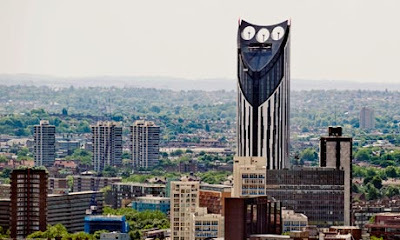 In 2010 the architects of the planned Dalston Kingsland towerblock, London-based BFLS (formerly Hamiltons Architects), won the annual Carbuncle Cup competition run by Building Design magazine for “services to urban impropriety and breakfast-extracting ugliness”. The lead panel judge said that “Councils are meant to protect us from these buildings. 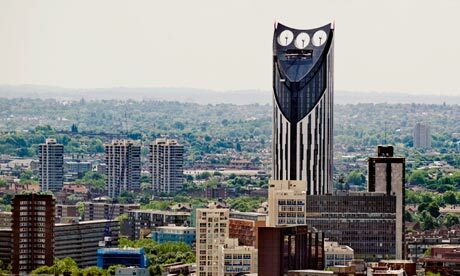 How on earth did it get planning approval? " 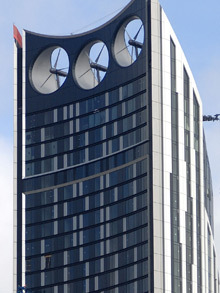 BFLS's 43 storey, £113 million, Strata Tower is part of a "regeneration" scheme at Elephant and Castle. Some 50-75% of the flats were bought by buy-to-let landlords. 25% of the flats, on the tower's bottom floors, are "affordable homes" and there's a three-floor 'pavilion' to the side of the tower for Council tenants. BFLS Dalston Kingsland towerblock will have no affordable housing but residents will be given planters and encouraged to grow their own veg. BFLS Dalston Kingsland towerblock's north west corner - "a localised zone of (wind) acceleration where the comfort criterion for standing is exceeded". 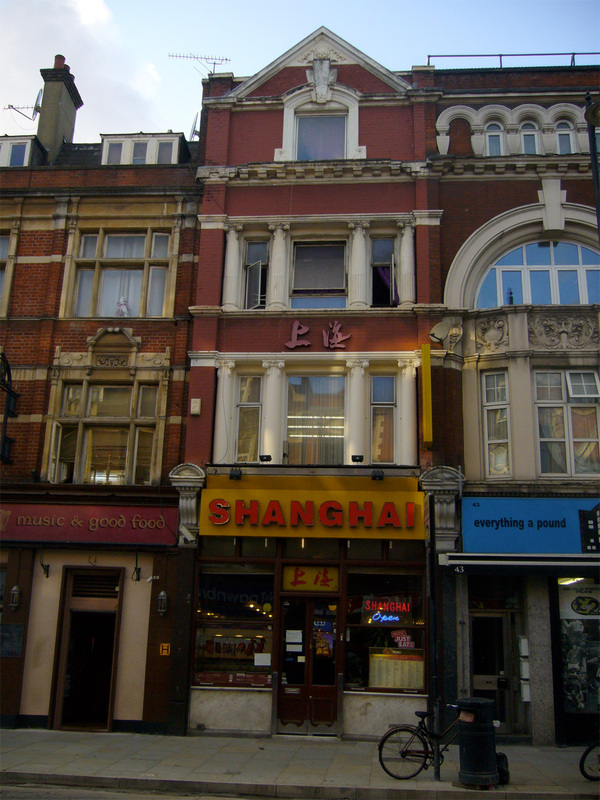 Does Dalston need a landmark building? Do we need a "landmark building" to know where the Dalston Kingsland station is? Yes, according to the Council and the developer seeking planning permission for the new towerblock. They say we need a "visually sustainable" landmark building to mark the "gateway" to the town centre, to give it "legibility" and a "sense of arrival". So, in the future, when we arrive at the station we will see the bleak North Face of the tower rising above us like a sheer 50 metre aluminium and glass cliff blotting out the sunlight. Then we will know that we have arrived somewhere. . But where? Dalston?... or is it Canary Wharf, Croydon, Dubai...it could be anywhere? But it seems from this survey that most people in Dalston already know where Dalston is. Couldn't the Council just put up a few more street signs to help any lost souls get to the station? We could save Dalston's local character, identity and lots of sunlight if we didn't need a towerblock to landmark the station. You can see details of the planning application 2011/3439 on the Council's web site here. The Council's official consultation deadline has now been extended. Dalston Kingsland towerblock - affordable housing abandoned. OPEN Dalston has learned that - following discussions between the developer, Transport for London, Hackney Council and the Greater London Authority - the authorities are unlikely to insist upon any affordable housing at all in the Dalston Kingsland towerblock scheme. OPEN Dalston has sent objections to the scheme to Hackney Council and to Boris' Greater London Authority which has power to over-rule the scheme. You can read about our main objections here.You can read our more detailed submission to Greater London Authority here The abandonment of any affordable housing now adds insult to injury. 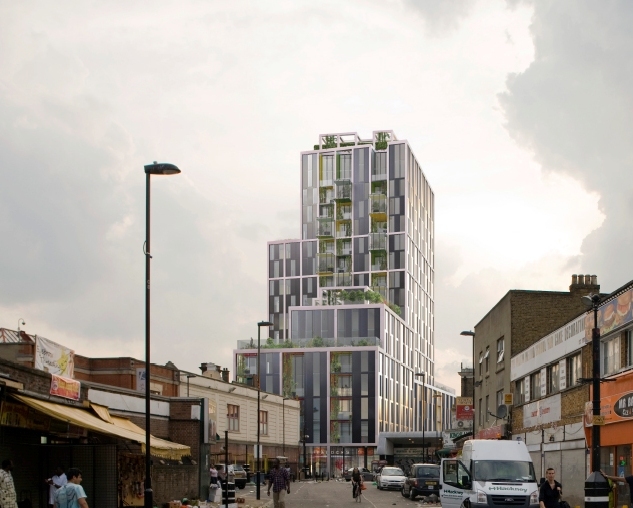 An artists impression of the 50 metre high, 18-storey tower planned next to Dalston Kingsland station. Although dressed in green, it doesn't meet the Code 5 standard for sustainable homes. Last December the government refused Hackney grant funding for upgrades to Dalston Kingland station. The developer now argues that if it is to pay all the £1.7 million, for remodelling the station frontage and installing lifts to the two platforms, the towerblock scheme is not sufficiently profitable to include any affordable flats at all. The penthouse duplex apartments in the exclusive private 'eco-tower' are to be marketed for about £1,000,000 each ( £1 million). The development will dominate the historic high street, its listed buildings and overshadow local homes, businesses, Colvestone Primary School and Ridley Road market. The developer argues that it is not financially viable to build anything smaller. The scheme submitted for planning permission, comprising 130 flats for private sale, originally included 17 flats at "affordable" prices - just 13% of the total although the official policy target is 50% . The developer argued that if it included 50% affordable flats it would only make £7.7 million profit and by including 17 affordable flats it would make only £10.9 million which is a "lower level of profit than the accepted norm". Now it is offering no affordable housing at all. Dalston Kingsland towerblock - deadline extended. Although the 'official' deadline expired on 30.1.12 Hackney Council have informed us that it will consider all comments received about this planning application up to the date of the Planning Sub-Committee hearing which is expected to be on 7th March. or by post to Hackney Planning Department, Hackney Service Centre, 1 Hillman Street, London E8 1DY ( fax: 020 8356 8110). 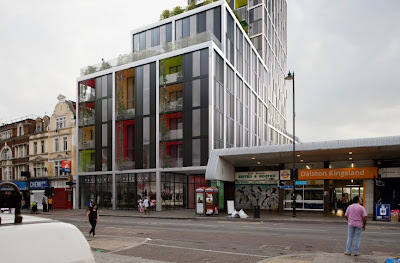 You should refer, in the subject heading, to Planning Application 2011/3439: Dalston Green at 51-57 Kingsland Road E8 2JS. You can find details of the planning application here and read more about it in the articles below.